Snow chains are the perfect solution to add traction to your tyres whether it be on ice, snow, slush or even mud. If you need to push a snowplough or a snowblade, or need to pull a tow behind gritter you will need snow chains for your tyres too. 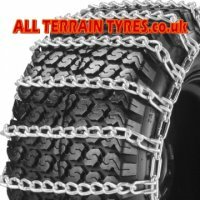 We stock snowchains to fit snow blowers, garden tractors, ride on lawnmowers, compact tractors, quad bikes, ATV's and UTV's. Our range of premium quality USA manufactured snow chains have crossbar chains spaced every two links along the side chains to give a smoother ride. Beware of inferior tyre chains with four link spacing - you will only get half the grip and an uncomfortable ride! 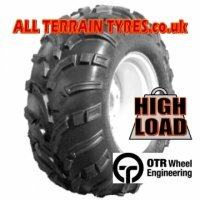 Turf tyres and quad bike tyres can often vary in size between different manufacturers so to ensure a perfect fit we recommend our premium snowchain kit. 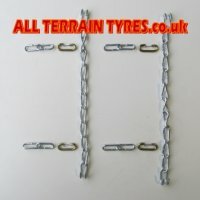 This includes a pair of snowchains for your chosen tyre size, a pair of tensioners to tighten the side chains, an extension kit which will add another two side chain links plus one crossbar and cable ties for tying back any loose chain links. 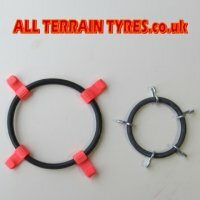 If you are on a budget you can just buy the basic snow chain kit and then purchase the extra fitting kits later if required. 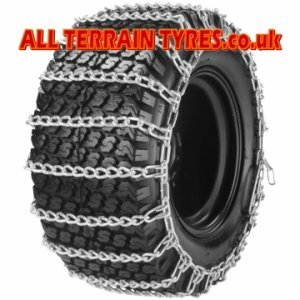 Buy your snowchains now before you need them - our couriers find it very difficult to deliver once there is a foot or more of snow on the ground!